Fred was appointed as club captain position at the start of 2007 when the club had been going through a difficult period due to a lack of players. Fred turned this round to such an extent that we can now turn up for a match with 13 players. Batted at number 5 or 6 can where he offered resilience to the lower order. A useful leg spinner who got his fair share of wickets, if sometimes over bowled. Surprisingly agile in the field and he could take some spectacular catches. 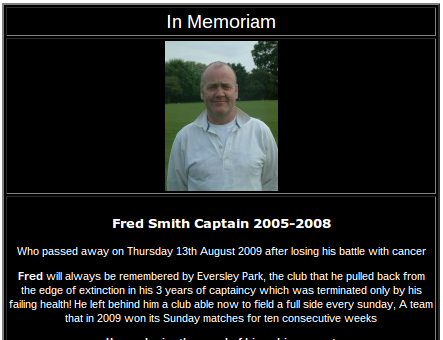 His health forced him to step down from the captaincy in 2009, and sadly he passed away on August 13th 2009, but he will always be remembered by Eversley Park!